As the popularity of cigarettes declines, more young adults, including Rollins College students, are resorting to a small, handheld vaping device called a JUUL. The JUUL’s original purpose was to help people who were addicted to cigarettes stop smoking. Now, it has become a nationwide trend for young people. “I [use a] JUUL because it gives me a head rush. When I used to have a JUUL, people would ask me all the time if they could take a hit,” said Christina McAlpin ‘21. “It’s very popular at Rollins, like I see people walking around campus using them. At the moment, I’m not addicted, but when I owned one I was,” McAlpin said. JUULs are about three inches long and look like a flash drive, making it easy for students to carry them in their pockets and backpacks. The JUUL has been sweeping the nation since it was introduced by PAX Lab in 2015. It has become so normalized that the product has even developed its own verb: Juuling. At Rollins, students are seen using their JUUL while walking to class, at parties, or strolling down Park Avenue. 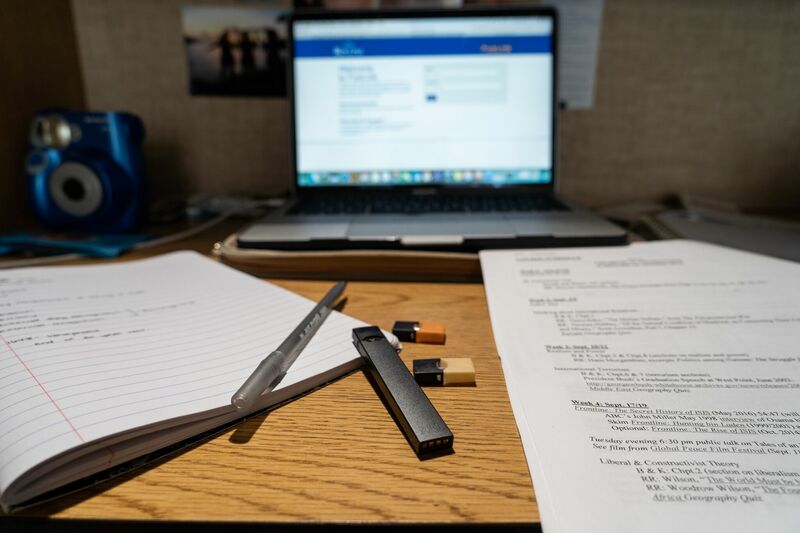 In a recent survey conducted by The Sandspur, of the 363 students that responded, 46 percent said they had used a JUUL at some point and 18 percent own one themselves. Approximately 88 percent of respondents knew what a JUUL was. “Juuling is showing addictive trends. However, there is not enough solidified research to show the specific long term effects on Juuling alone since it’s so new,” said Denise Snyder, Rollins Wellness Center’s family nurse practitioner. Students enjoy using them because of the instant head rush it provides without the lasting smell and aftertaste of cigarettes. JUUL pods come in eight flavors and contain five percent nicotine. As of August, JUUL said they would start selling three percent nicotine pods of mint and Virginia tobacco flavors. JUUL’s “starter kit,” which contains the e-cigarette, USB charger, and four flavor pods, sells for about $50, and four-packs of pod replacements cost $15.99. The company’s website said that 200 JUUL puffs is equivalent to one pack of cigarettes. Because it contains nicotine, many people believe its health effects are just as detrimental. Nicotine is classified as an addictive drug and is harmful for the developing brain, according to the United States Surgeon General. College students are still undergoing the developmental process and can experience harmful effects later in life. “It is just as bad as smoking cigarettes to me,” said Raven Olson (‘20). She said that it is common for people to ask her if she wants to “hit their JUUL,” but she always refused. The sleek devices have been dominating the e-cigarette market, covering 33 percent of e-cigarette sales since 2017. The Sandspur’s survey showed that 33 percent of respondents said they smoke their JUUL inside. When asked if they use their JUUL in class, 3 percent answered yes, 3 percent answered sometimes, and 93 percent answered no. Rollins College smoking policy refers only to cigarette usage, which can only be used in designated areas. Therefore, the campus has no restrictions on Juuling. The Sandspur’s survey asked students if they thought JUULs were addictive; addictive but not as bad as cigarettes; or not addictive at all. The findings showed that 69 percent believed they are addictive, 18 percent believed that they are addictive but not as bad as cigarettes, and 13 percent answered not at all. “Every time we inhale a substance, we are changing the PH balance of our lung function which will have short term and long term consequences to our health,” Snyder said. “Health services is happy to support and meet students who want to reduce or discontinue any form of substances. There is also a substance abuse counselor on staff named Reneé Treviranus and she would be happy to meet with any concerned students,” Snyder said. If any student wants to reach out to Treviranus, call the Rollins Wellness Center and ask for her services regarding substance abuse.